Photo by Kerry Booth Tate. Sharon Song 07/09. Plant 118cm diameter, flower clump 9cm, floral bracts 16cm diam. "Todd". Grown in NZ. *Note reverse variegation. 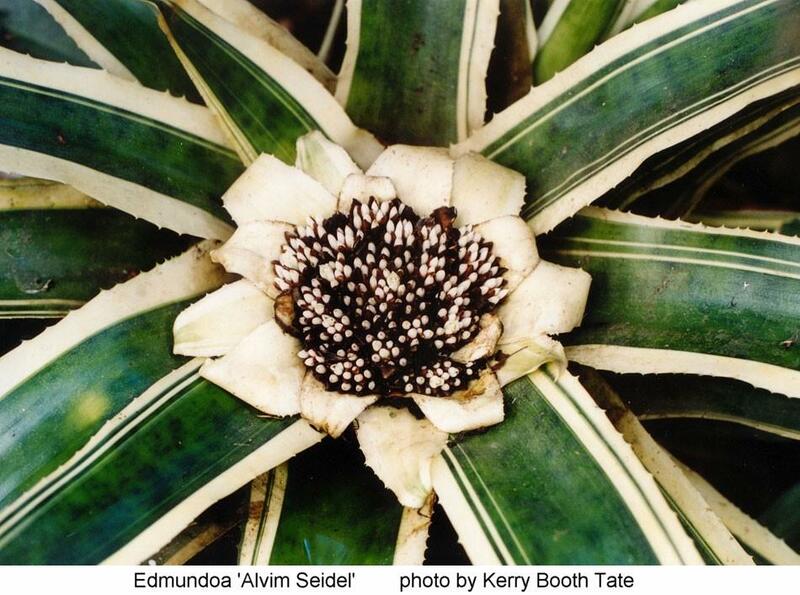 This is a first in at least two ways: firstly this is the first cultivar name to be allotted to the Genus Edmundoa, and secondly it is the first time the name Alvim Seidel has appeared as a Cultivar name. There are only two species currently in this genus so there does not seem much scope for a dramatic increase. But when Edmundoa lindenii var lindenii sensu Leme has 16 synonyms and Edmundoa lindenii var rosea has 11 synonyms you would think there would be scope for some horticulturist to come up with something supposedly unique and give it a cultivar name. 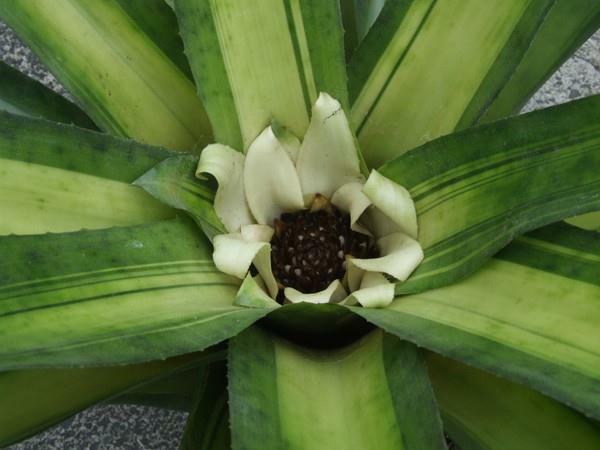 Just think of Aechmea chantinii, Guzmania lingulata etc etc!! 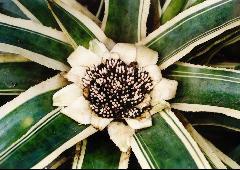 A variegated form of Canistrum lindenii cropped up in the 1970’s. Little is known of its origins but by this time taxonomists interest in these sorts of plants was beginning to wane – and quite rightly so, because variegation is in the realm of the gardener and thus cultivars. Anyway, this variegated form was never formally described but did appear in Alvim Seidel’s catalogue in 1976 as Canistrum lindenii var exiguum variegatum. These days we frown greatly on these Latin words used by Nurserymen to hint that by using variegatum it is an official name and not a made up one! Certainly var. 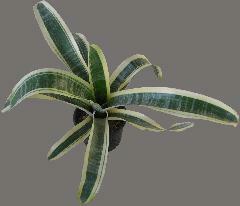 exiguum was used by Reitz but not any hint of variegation. ‘Exiguum’ means small or puny which can refer to any part of the plant. Alas this name is one of the current synonyms and if you have ever tried to find details of old synonyms you are in for an adventure! So if anyone has access to Anais. Herb, Barbosa Rodrigues 2:37. 1950 please advise. So there it was at US$120 which suggests there could not have been many in existence! 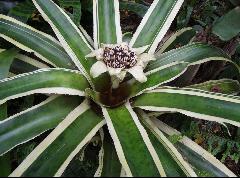 The next reference was in Kent’s Bromeliad Nursery Catalogue circa 1979 where we find C. lindenii forma exiguum ‘Albomarginata’ for US$ 75 and ‘Variegata’ for US$25 suggesting they too had problems in defining if there is anything that can be called stable within the 5 forms of variegation! But the price was dropping. In the 1970’s its offsets must have got to Gulz in Germany because towards the end of the decade, Ede Schaefer had imported it to Adelaide. By 1983 it was in the hands of Pinegrove Nursery ( see BBK#625) from Schaefer as ‘variegata’. 1984 was a busy years because Pinegrove received a C. lindenii var. lindenii forma procerum ‘Albomarginata’ from Bill Morris and Peter Tristram. These could well have got to Australia from Kent but why the subtle name change. Could this have been the influence of Bill Morris? Interestingly forma procerum ( tall scape) has only been linked to var roseum officially. They also got a C. lindenii forma exiguum ‘Variegata’ from an unknown source which tends to link somehow with the Kent’s offering. No attempt seems to have been made at Pinegrove as to what subtle differences there may have been when first obtained. In the intervening 20 + years a variegated and/or albomarginate Canistrum lindenii has crisscrossed Australia and is now known as an Edmundoa. Some seem to have the fairly dominate and fairly stable albomarginate leaves but others report irregular variegation to almost disappearing. Can they be traced to the original Brazilian find? This will never be known but I have a feeling that because ‘everybody’ wants a variegated plant offsets would have moved around very quickly. From the plant owned by Kerry Tate I would suggest strong links to the Bill Morris named clone because it has white primary bracts linking it to var. lindenii AND has an elongated scape linking it to the name ‘procerum’. From what I have gleaned, nobody has bothered to look for differences in the various variegated plants – perhaps they thought that variegation was enough to worry about! 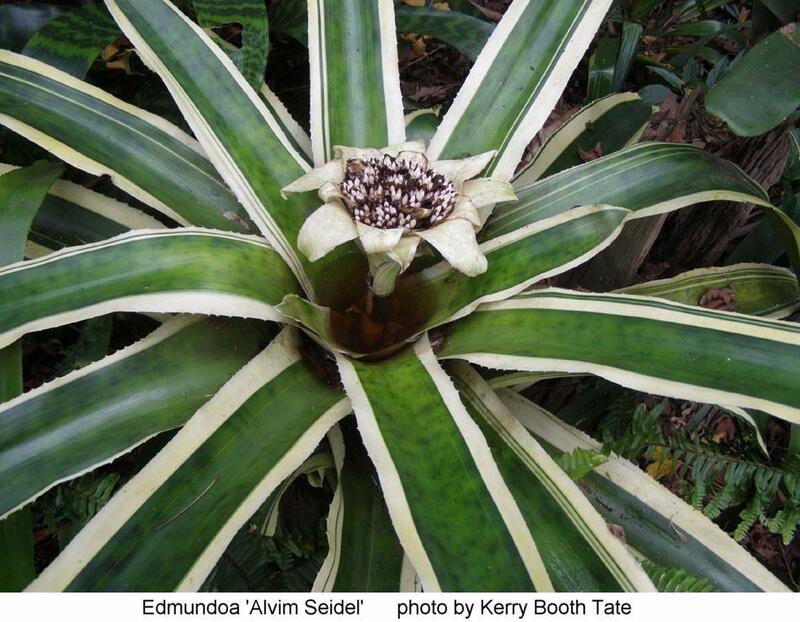 So I have decided to honour Alvim Seidel with the name linking to Edmundoa lindenii var lindenii.This covers all forms of variegation. Donato Seidel was pleased that we are commemorating his father but has been unable to shed any light as to how this variegated plant came into existence. We have ‘solved’ the problem of the white primary bracted variety but what about var. rosea? 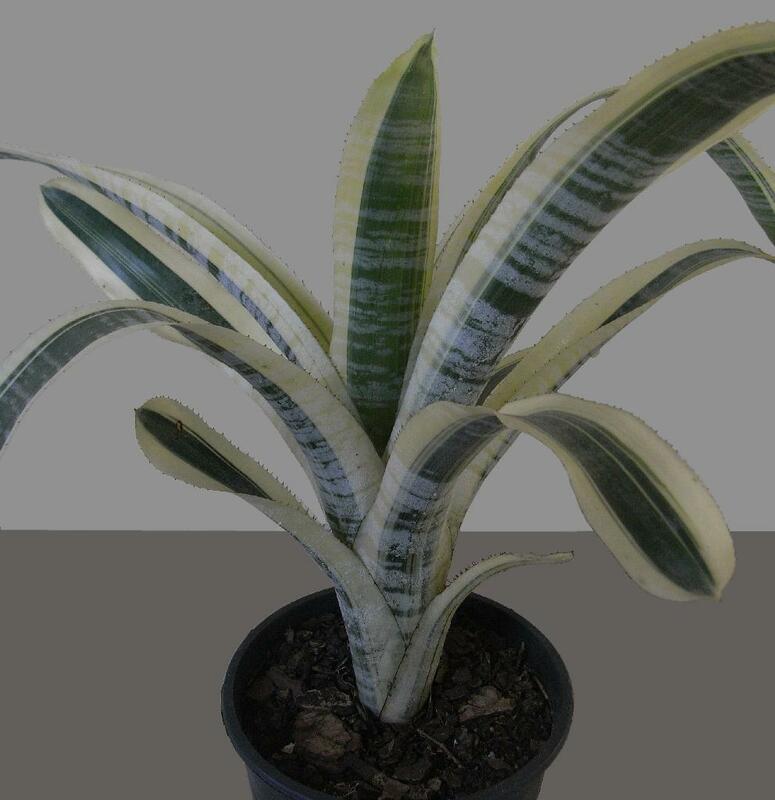 Would Aussie growers please be on the look out for a variegated form of this? If it is here then we can name it. I know it is growing in Florida, USA and you never know – the Floridians may beat us to the post! Sharon Song plant - from Joyce Thomas. This plant was imported by Joyce Thomas (and possibly by Marjory McNammara) and has been very stable over many generations. 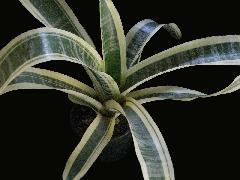 It was purchased in 1983 for $40, from the Seidel catalogue, as Canistrum lindenii var. 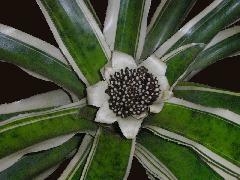 exiguum variegatum. 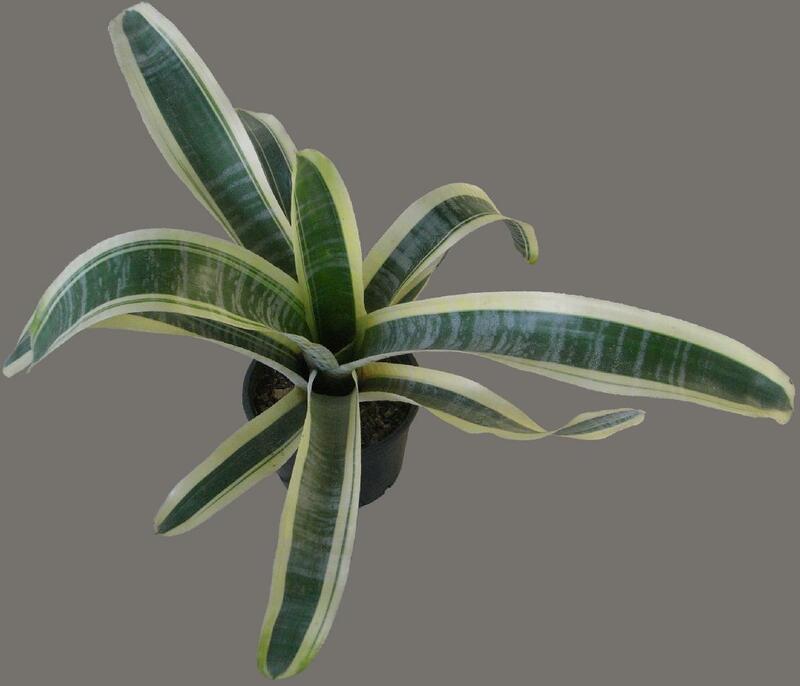 The 5 or 6 different types of variegation are not covered under ICNCP naming rules. Derek Butcher, as Registrar of hybrids, adopted a policy of one cultivar name to cover all variegated forms. Although exceptions were at times made e.g. Neo Predator and Predatoress. The new Registrar may, or may not, have his own policy.